This week we're doing something a little different with our Happy Stampers blog hop. As many of you may have noticed, the founder of this hop, Sandi MacIver, hasn't been able to join us for the last few weeks. She's been dealing with some significant health issues and she's having surgery today to start her treatment. We wanted to let Sandi know that we were all thinking of her, so we've all created a card using this week's Color Challenge that will send a little hug her way. We're looking forward to having Sandi join us again soon! Sandi is such an inspiration and creates the most beautiful cards. I try and be like her and every week when I create, I'm thinking Sandi-Style...but then with my own personal touch -- which normally is in the form of "bling" and those Rhinestones I love so much. Not sure if I'll ever be able to do water coloring like she does, but I love looking at every project she creates and am like "WOW!" 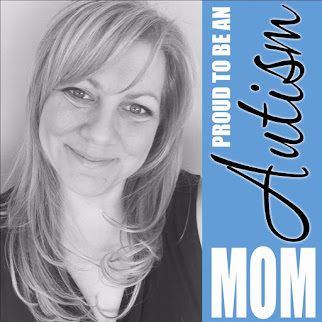 Check out her blog at StampinWithSandi.com if you haven't already. She is fearless and tough as nails, so determined and a fighter. Truly, she is remarkable. She is a dear friend but so much more to me. She is my business partner and one of the most amazing women I know. I am blessed to have her in my life and am praying for her today and every day. My card has a splash of the Cajun Craze and Mint Macaron too. Specifically showing a picture of the ferns/leaves as I used the Marker Technique and Rock-n-Roll together. LOL. So, I colored the stamp with Old Olive marker (as I couldn't find the ink pad!!!! uuuggghhhh)....then I literally stamped the image on Basic Black ink pad (without "rolling") and this was the result. And I love it! Definitely different and I don't think it could be accomplished any other way (even if you took a Black marker and tried). I love how the edges of certain leaves picked up the black. What would you call this technique? hmmmmm.... Would love to hear your comments? You could actually do today's card I think in 10 minutes or less! Card base is Basic Black. Then a Hello Honey patterned piece of Botanical Gardens DSP adhered to that (4 x 5.25). Next I stamped on the Whisper White piece of paper (3.75 x 5). 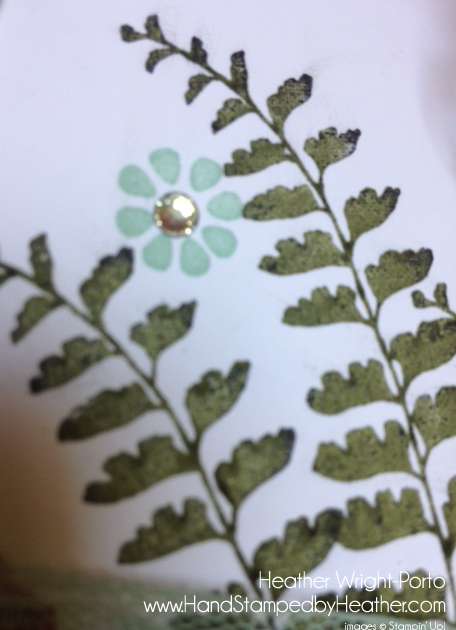 I stamped the ferns in Old Olive/Black, the flowers in Mint Macaron, and the greeting in Basic Black. Then with a floral piece of Botanical Gardens DSP, I cut out the center with the Labels Framelits collection. Then adhered it to the Whisper White with Stampin' Dimensionals. Then tied ribbon around that entire panel. Adhered the front panel to the Hello Honey with Stampin' Dimensionals. 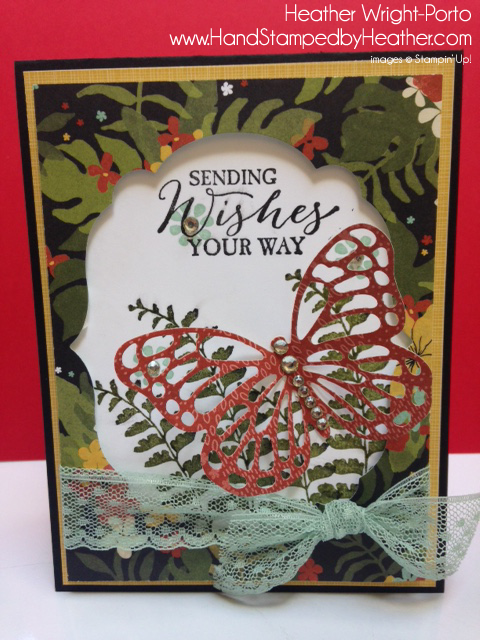 Cut out the medium butterfly in the Butterfly Basics Framelit collection using a Cajun Craze patterned paper and adhered with Mini Glue Dots. Add the bling and you're done! 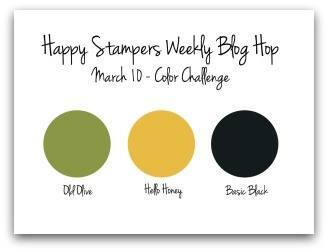 Next on our Happy Stampers hop is the very artistic and creative Amy Koenders!!!!! Beautiful Card Classes And So Much MORE! 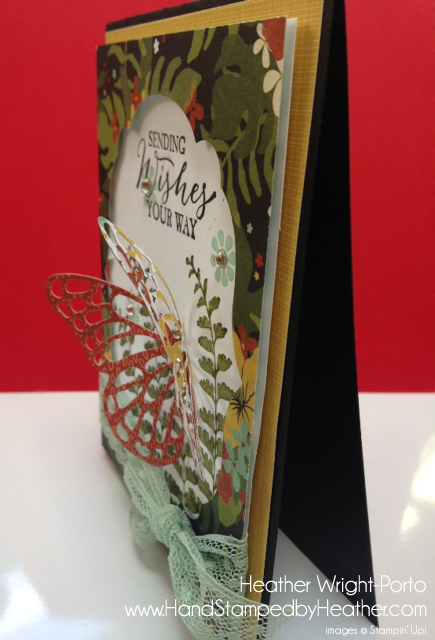 Come join us at Stamping and Blogging where there is a new card class each month! Jan, Feb, and March 2016 showcasing products from the Stampin' Up! Occasions Catalog! Join us today and get busy Stamping and Blogging! So pretty Heather! Love the frame that you've created, perfect with colors this week! Beautiful card Heather....Sandi will love it. !!!! wow Heather, I love how you made the frame from the DSP and then stamped the background, it's creating a beautiful 3-d effect and thank you so much for your kind words, I miss you all too, and now that I'm past that nasty surgery and back home recouping, I hope to be hopping with you all again real soon.